The racially charged photo compilation above appeared in the 1984 yearbook of the medical school Gov. Ralph Northam attended with his name on the page. 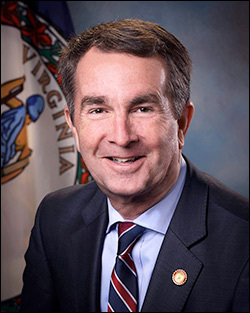 Feb. 5, 2019 — Virginia Democratic Gov. Ralph Northam continues to reel, and many believe the increasing pressure upon him to resign will force him from office within the next 48 hours. Northam defeated former Republican National Committee chairman Ed Gillespie, 54-45 percent, in the 2017 statewide election. His term will expire at the beginning of 2022. 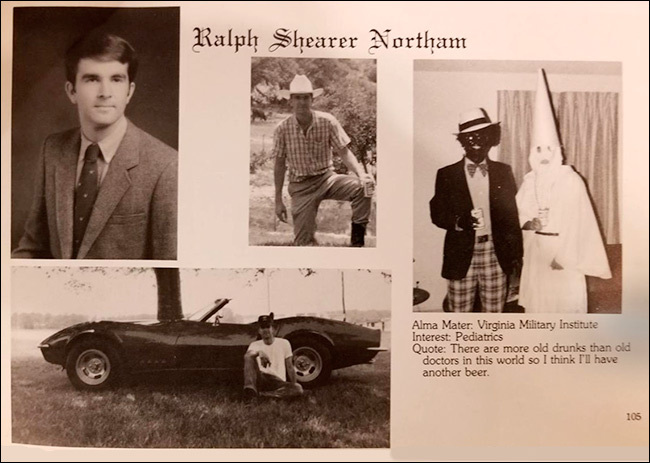 The number of Democrats publicly opposing Northam over the publication of a racially charged medical school year book picture increased substantially over the weekend, capped by a joint pro-resignation statement issued from Sens. Mark Warner and Tim Kaine, along with House Education & Labor Committee chairman Bobby Scott (D-Newport News). Former Gov. Terry McAuliffe, who Northam served as lieutenant governor, and Congressional Black Caucus member Donald McEachin (D-Richmond) also joined the chorus of detractors in addition to Democratic National Committee chairman Tom Perez, former Vice President Joe Biden, several other presidential candidates, and ex-Virginia Gov. Doug Wilder, the state’s first African American governor who was elected in 1989. Jan. 18, 2017 — Yesterday, we wrote an update that quoted a December Public Opinion Strategies (POS) survey testing the Virginia gubernatorial candidates (Dec. 11-13; 500 likely Virginia voters; Lt. Gov. Ralph Northam (D) 43 percent — ex-RNC chairman Ed Gillespie 38 percent) and made the statement that the poll is still worth considering because not much would politically change over the Christmas and New Year’s holidays. Apparently, such is not the case. A more current study (Mason-Dixon Polling & Research; Jan. 5-10; 625 registered Virginia voters) shows a different result. According to the Mason-Dixon data, it is Gillespie who leads, forging a 44-41 percent advantage over Lt. Gov. Northam. In the previous POS poll, the other Republican potential candidates, Prince William County Board chairman Corey Stewart and state Sen. Frank Wagner, were within basically the same range as Gillespie. That’s inconsistent with Mason-Dixon, however. In this poll, Northam does considerably better against Stewart, leading him by a relatively robust 45-38 percent spread. Wagner was not tested, probably because the state legislator had less than 10 percent name identification according to this same sampling universe. Nov. 3, 2016 — Entering the last week of campaigning, the Democrats are on the cusp of re-claiming the Senate majority they lost in 2014, but virtually no competitive outcome is yet secure. The latest Hillary Clinton email revelations may cause irregular Republican turnout to increase, which should help the GOP Senate candidates. A demoralized Republican voter base, thinking that Donald Trump would have no chance to prevail against Clinton, is about the only way Democrats could have gained a wave effect, but that is no longer expected. It appears that nine of 10 Democratic in-cycle states will remain in party control. Only Nevada is competitive on their side of the ledger. Republicans look to have 15 safe seats of their own, with another five: Arizona (Sen. John McCain), Iowa (Sen. Chuck Grassley), Georgia (Sen. Johnny Isakson), Florida (Sen. Marco Rubio) and Ohio (Sen. Rob Portman) all trending either strongly or nominally their way. Democrats are in favorable position to convert incumbent Republican states in Illinois (Rep. Tammy Duckworth-D, unseating Sen. Mark Kirk-R) and Wisconsin (former Sen. Russ Feingold-D, re-claiming the seat he lost to Sen. Ron Johnson-R in 2010), in addition to being favored in the open Indiana seat (former Sen. Evan Bayh-D ahead of Rep. Todd Young-R). Oct. 19, 2016 — Most projections suggest that the 2016 US Senate election cycle will end in a partisan division close to a 50-50 tie between Democrats and Republicans. If true, a new political poll suggests that the final determining factor won’t occur until well beyond Nov. 8. A new JMC Analytics and Polling survey of the Louisiana Senate race portends that this open seat contest will be headed to a Dec. 10 run-off election. Therefore, if one Republican and one Democrat advance from the field of 24 candidates, it will mean the country must wait a full month after the general election to determine whether the Senate is tied or one party reaches 51. But, such a majority may only last for a year. Assuming Hillary Clinton is elected president, her vice presidential nominee, Virginia Sen. Tim Kaine, will have to resign his seat. Gov. Terry McAuliffe (D) will then make an appointment – sure to be another Democrat – but this person will only serve until the next statewide general election. Because Virginia elects its governors in odd-numbered years, the special Senate election will subsequently take place in 2017. Therefore, if the Senate breaks 50-50, with that last seat being from Virginia, the majority will be at risk just one year later. This will make an Old Dominion statewide special election the nation’s political focal point, at least in terms of determining Senate control.